Bits of My Own: A Little Blogiversary Giveaway! My 3 year blogiversary will be on January 14th. In years past, I have completely missed this auspicious occasion! I thought it might be nice this year to mark the occasion. We had another snowstorm yesterday. The snow looks so lovely, peaceful and serene outside my window. It reminded me of this pattern I have in my stash. 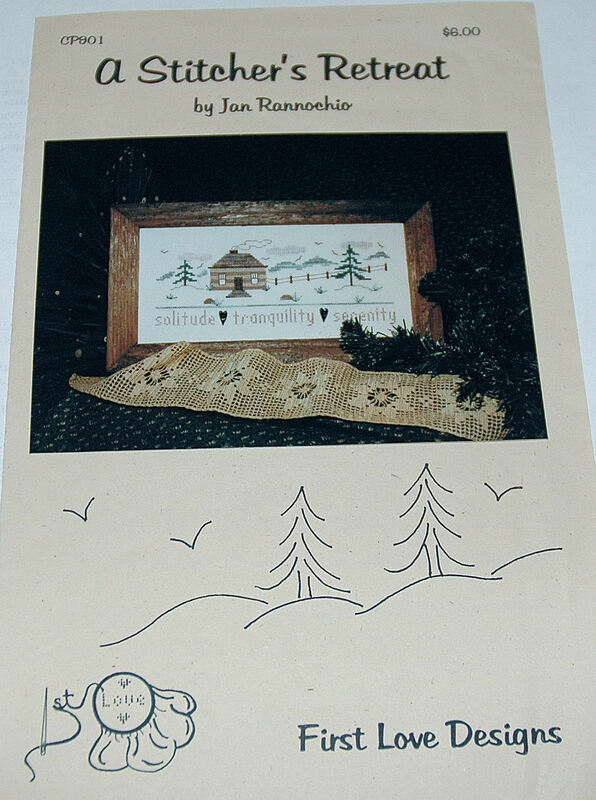 The pattern is Stitcher's Retreat by Jan Rannochio. Please don't get too excited because the drawing is just for the pattern. I just read that apparently it came with 2 buttons to sew on between the words. I never had these. I bought the pattern by itself. As I said, no bid deal giveaway. It just reminded me of the scene outside my window. "We stitchers often dream of a faraway place, filled with peace, tranquility and endless time to pursue our craft. 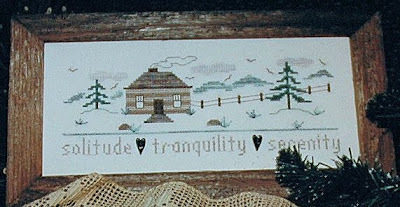 Although we may not be able to physically accomplish this dream, may our joy and love of needlework magically carry us to this "Stitcher's Retreat"." If you think you would like this pattern, just leave me a comment on this post. Don't forget to leave a way to get in touch if you don't have a blog. If you have a blog, please feel free to post the giveaway. I will have the drawing on January 14th. What a lovely pattern! I would LOVE to receive this is the giveaway. Thank you for the offer and happy Blogiversary! What a lovely pattern. I'll be sure to repost on my blog. Thanks for the nice comment on my blog. I've enjoyed looking at your site and some of your work. Just beautiful! I'll be back to visit soon! Happy blogiversary, Erica. It's a lovely pattern. I would love to have a chance to win. It's a nice pattern, and with some buttons from any quiltshop it would look very nice, I think. Greetings from a Tusal-companion from Belgium. Thanks for visiting my blog Erica. The pattern in your give-a-way is very peaceful. I've been lucky to go to a stitcher's retreat and it was all of those things and more. Don't we all need some tranquility these days? Happy Blogoversary! I love the pattern you are giving away. I've never seen it before, but it's lovely. Thank you for the chance!